Activity by Lucky Generals shines a light on sexual harassment in the industry during the festive period. Have you heard the one about the agency chief executive who covered himself in green face paint to dress up as Hulk for the office Christmas party, only to leave evidence of his wandering hands on his female colleagues? Or the investment director who took the Christmas party as an opportunity to share an explicit photo that he pretended belonged to a female colleague? It is not just Brexit jitters that mean adland's famed Christmas parties aren't as decadent as they once were. Of course decadence does not automatically equate to sexual harassment. Yet a culture that places heavy drinking at the epicentre of employee engagement feels increasingly out of step with business culture at large. Against this backdrop, TimeTo has launched four new executions as part of its "Where do you draw the line?" campaign tackling the Christmas party season. The work, by Lucky Generals, continues to reflect the real-life experiences of people working in the UK advertising and marketing industries. Kerry Glazer, president of NABS and CEO of the AAR, who is also on the TimeTo steering committee, explained: "The responses to our industry survey told us that the combination of social occasions and alcohol was a common factor in the incidence of sexual harassment. Christmas is the time where people in the industry are not only entertaining their business contacts and clients but are also attending their own company events to celebrate the festive season. The timeTo message is a timely reminder to stay on the right side of fun and enjoyment on these occasions, and to not let the party atmosphere lead to people finding themselves on the receiving end of unwanted or uninvited sexual attention." According to Glazer the key here is promoting understanding and awareness of - and the importance of taking personal responsibility for - the behaviours that will minimise or prevent sexual harassment occurring. "It’s not the bars or a meeting room, or a party venue, or restaurant, or a taxi that are the enemy; it’s how people might choose to behave when they are in them," she explained. "The real solution is making sure that we take both corporate and individual responsibility for understanding what constitutes unacceptable behaviour as far as sexual harassment is concerned, and why it is unacceptable," Glazer added. The executions will run on social media and digital assets across the UK ad industry. TimeTo is making the assets available should companies want to run them on their own websites or in their offices. Karen Fraser, director at Credos, said: "Over 3,600 people responded to the TimeTo study and of those who gave details about their experiences of sexual harassment, 20% mentioned alcohol and 18% work parties or events, while others detailed experiences with colleagues in cabs. The three risk areas – alcohol, parties and taxis – in which sexual harassment is most likely to happen are also an integral part of the festive season. 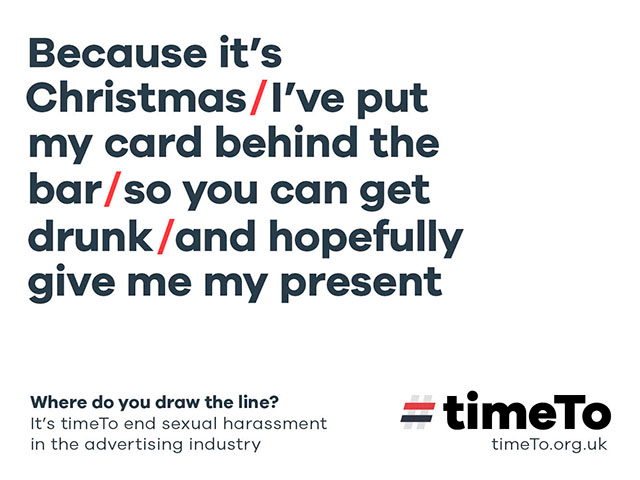 These new ads are a timely reminder of the importance of reading and understanding the TimeTo Code of Conduct, which has been developed to help everybody enjoy the festive celebrations without fear of sexual harassment." The latest ads follow the launch of the above-the-line campaign in October. Helen Calcraft, a founding partner at Lucky Generals and who is on the TimeTo steering committee, said: "Yes, it is about rooting out serial offenders and individuals, but it is also about addressing the wider cultural change needed and that is bigger than any one individual." Since the campaign launched, a further 50 companies have signed up to support TimeTo, including Spotify, Nexus Studios, Oath and FCB Inferno. This brings the number of companies supporting the initiative to 165. 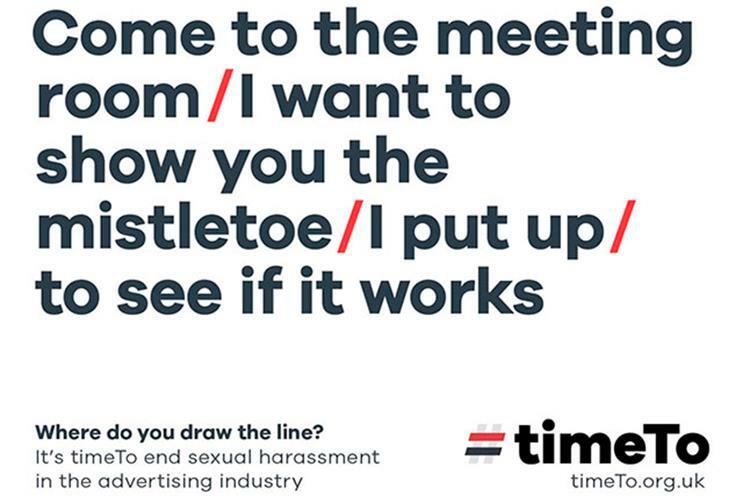 TimeTo’s research, based on a survey of 3,580 people working in UK advertising and marketing communications, revealed that sexual harassment in the industry is far from being in the past. Some 20% of female respondents aged 18 to 24 have already been sexually harassed in the few years they have been working in the industry. Meanwhile, 5% of men in the same age group have also experienced sexual harassment. Stephen Woodford, chief executive of the Advertising Association, said the industry needs a "cultural reset" to tackle the issue. He added: "Do not tolerate it. Time is up – this is one of the biggest societal and cultural changes in decades and it is up to every individual to help."